It’s here! 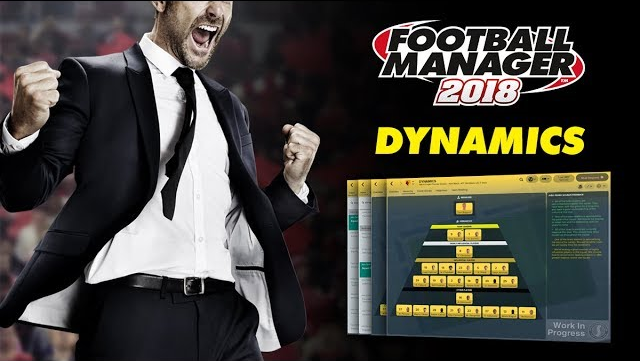 Time for a first look at the brand new ’Dynamics’ feature in Football Manager 2018 with Episode #1 of Inside FM2018. 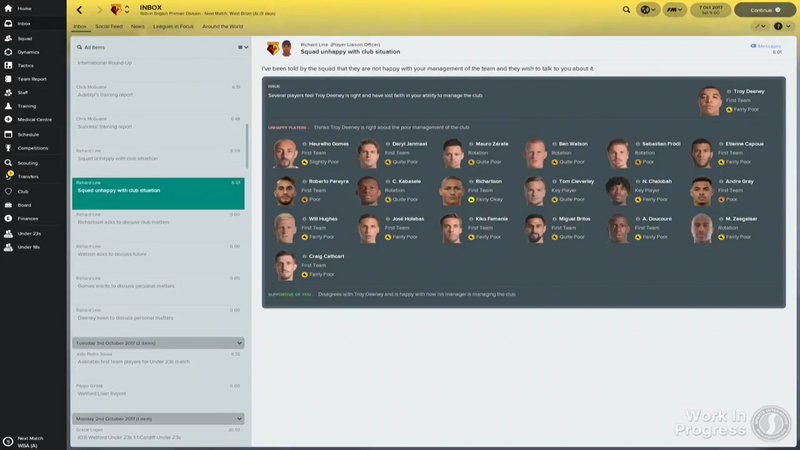 Dynamics is a new module for Football Manager that correlates your management of the dressing-room with your team’s performances on the pitch. In short… a harmonious dressing room will play more fluently while a more fractured team will be less fluid come match day. 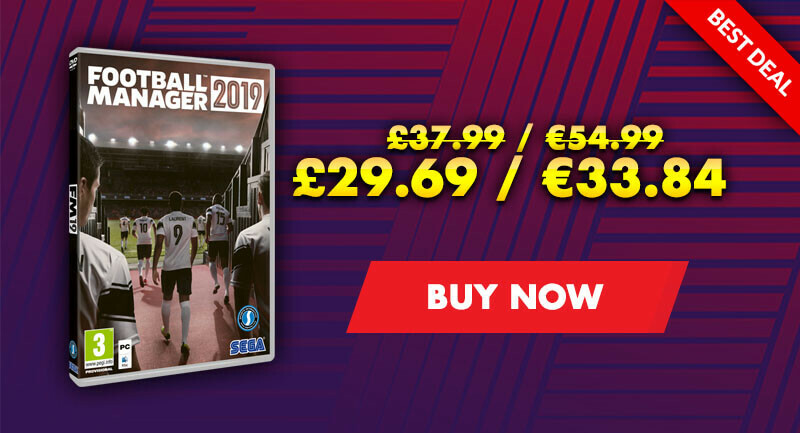 When you start your career in Football Manager 2018, you’re presented with an introductory email explaining the current squad dynamics situation at your club, along with a brief overview of the different elements that make up the Dynamics module. Introductory email explaining the current squad dynamics situation at your club. These are then supplemented by monthly Dynamics updates as you progress through your career. You’ll also notice that there is a new, dedicated Dynamics section integrated into the sidebar. Click on this at any point to view an in-depth breakdown of the Dynamics within your squad. 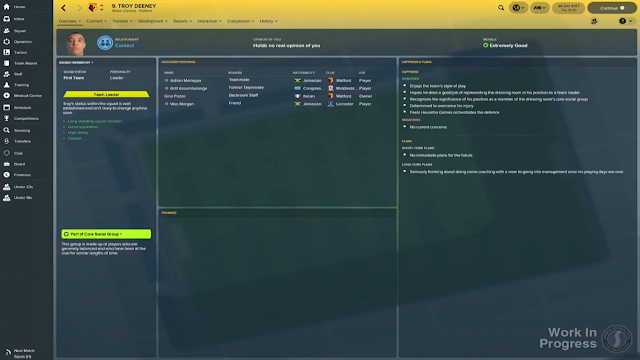 You can also see the most influential players in the squad as well as any issues that may currently affect your playing staff. 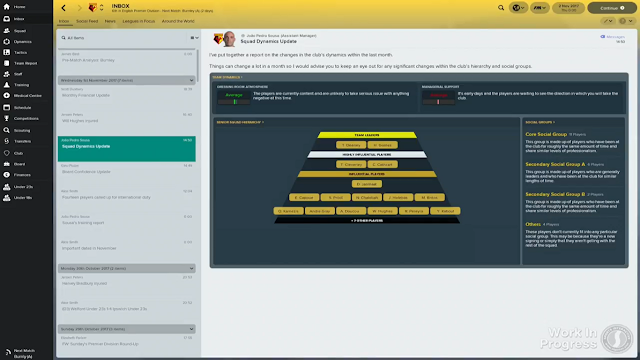 At the top of the Overview screen you can see the three mains areas you need to keep on top of: Match Cohesion, Dressing Room Atmosphere and Managerial Support. 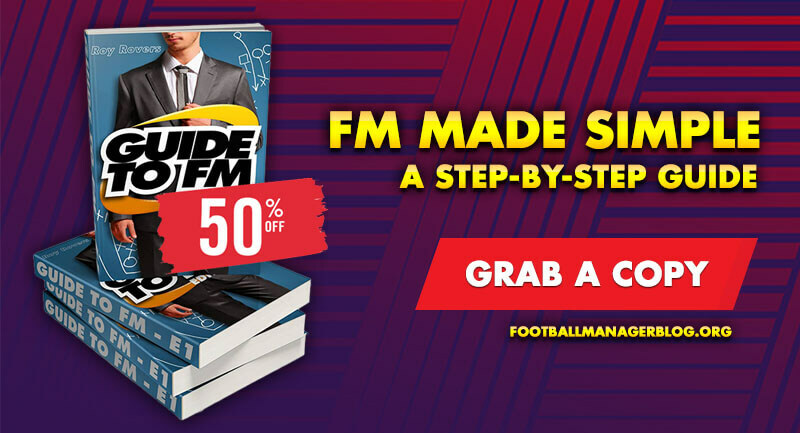 Let’s start with Match Cohesion in FM18. Match Cohesion relates to the understanding between the players on the pitch. A good level of understanding can mean that your squad benefits from an improvement in their collective mental attributes rating. For example, your midfielders may see an improvement in their ‘vision’ attribute, meaning they’ll be able to pull-off more defence-splitting passes as a result. Working on Team Cohesion in training – and also improving individual players’ mental attributes – helps to develop this understanding. The Dressing Room Atmosphere reflects the mood in the camp, with the larger and more influential social groups having the greatest effect. This atmosphere can affect players morale to different degrees depending which social group they are in. It’s also important to bear atmosphere in mind whilst making new signings, as the right player and the right atmosphere will make integrating them into the squad easier. And buying the wrong player at the wrong time may cause atmosphere to drop overall. are likely to side against you… but more on that shortly. 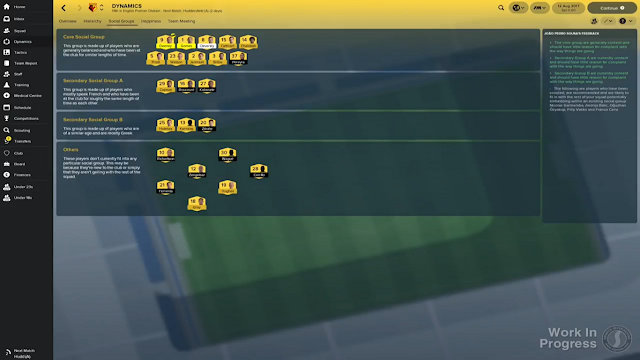 Let’s move on and take a look at the Hierarchy screen in FM18. This screen shows a pyramid view of the players, ranked by their influence in the dressing room. At the top you have your ‘Team Leaders’… usually players who have been at the club for a number of years or have good leadership skills – the kinds of players who might make the best captains. It’s most important to keep Team Leaders happy as they can help turn the dressing room in your favour if one of the squad speaks out against you. However, if you upset a Team Leader it could turn the rest of the players against you. Next you have ‘Highly Influential Players’ who might have one or two of the skills needed to be a Team Leader, but don’t quite have the influence to join that elite group. Following these are the ‘Influential Players’ who could become Team Leaders in the future. Finally there are the ‘Other Players’ who will be influenced by those above them. On the right-hand side of the screen you can see feedback from your assistant manager about the current positives and negatives within the team’s hierarchy, allowing you to adjust your scouting plans accordingly. 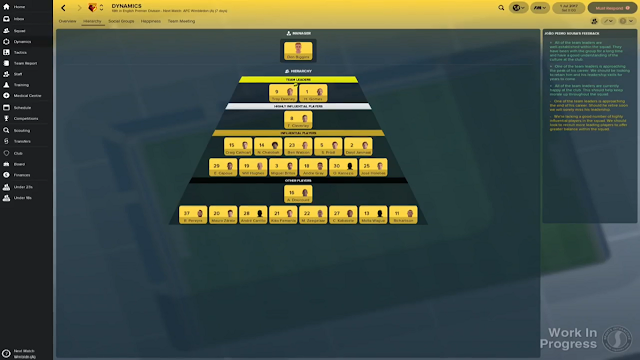 You can click on any of the players inside the pyramid and see their squad status, personality and happiness as well as a breakdown of why they’re in the position they’re in within the hierarchy. 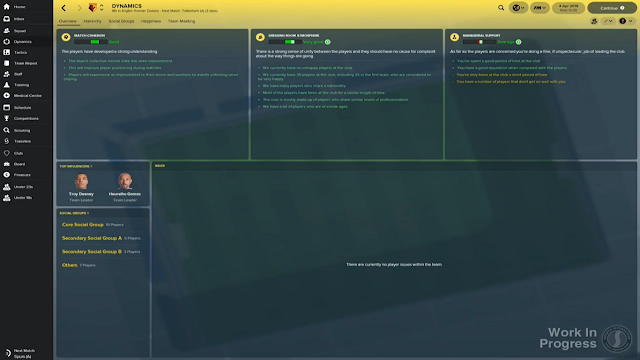 With Team Leaders in particular, you can ask them for advice on improving the dressing room atmosphere as well as asking them to let you know of any issues within the squad. You’ll notice as well that you can see what social group each player fits into, so let’s take a look at the ‘Social Groups’ screen and explore this in more detail. Social Groups greatly expand on the relationship system from previous Football Managers. This now makes the bonds that are formed between players more important for you to consider when dealing with your squad. The Core Social Group is the largest and most influential group in the dressing room. There are lots of factors taken into account to decide which groups players end up in, and that could include players who have been at the club for a relatively long period of time, who have similar levels of professionalism, speak similar languages, players who are similar ages and more besides. You may have one or two Secondary Social Groups too. Players who don’t fit into a social group are in the ‘Others’ category. These might be players that have recently joined and are establishing themselves in the squad or just don’t gel with their teammates. If they meet the criteria, they may join a group after a short period of time but players can also drift out of social groups as the squad’s make-up evolves. Social Groups will alter the way you deal with players’ requests, as upsetting one member of a social group can turn the rest of that group against you, especially if they’re very influential. Upsetting one member of a social group can turn the rest of that group against you. 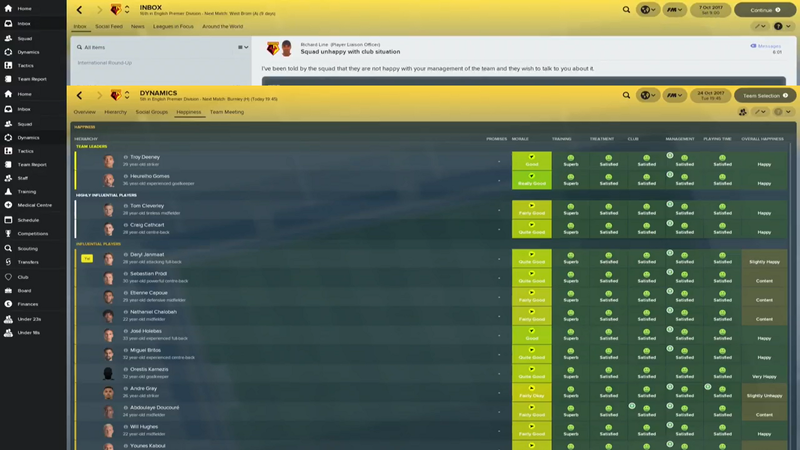 It’s worth checking the social group a player is in as well as your overall Managerial Support rating before deciding what response to take to a player coming to you for more first team football or a new contract, for example. Finally on the Dynamics section, we have the Happiness screen. This gives you a player-by-player breakdown of their happiness with the various different elements of their life at the club. 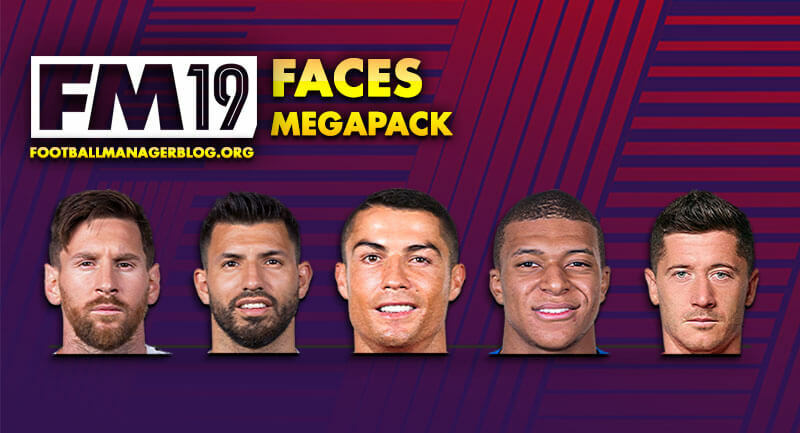 Players are grouped into their Hierarchy rankings so you’re able to see, at-a-glance, what areas you may need to tweak in order to improve the squad’s overall happiness. Dynamics has been integrated in the Home section and player profile too. On the Overview dropdown on the player profile, there’s now a dedicated Dynamics screen. This shows details of their opinion of you, their Hierarchy and Social Group information as well as elements of the Information screen from previous years. The Home section now includes a relationships page that lists your relationships with some of your fellow managers and, for the first time in the series, certain players too. As you can see Dynamics is a wide-ranging and three-dimensional system that will really change the way you approach your squad handling and man management. It can influence which players you scout and sign as you look to build a dressing room that can work together effectively both on and off the pitch long term. Get it right and it could be the key to turning title outsiders into league champions.